Tender chicken breast, sweet butternut squash and spinach are combined in a ready-made curry sauce, for a mildly spiced, low fat dish. Preheat the oven to 200°C, gas mark 6. In a large roasting tin, mix the curry powder and 2 tablespoons of the oil, then add the squash and stir to coat. Roast in the oven for 35-40 minutes until soft. Meanwhile, pour the curry sauce into a large sauté pan and stir in the chicken pieces. Simmer gently for 30 minutes, or until the chicken is tender, thoroughly cooked and the juices run clear when pierced with a sharp knife. Place the spinach in a colander in the sink. Pour a kettle of boiling water over the spinach and allow to wilt. Rinse the spinach under cold running water until it is cool enough to handle, then, using your hands, squeeze out all the excess moisture. Heat the remaining oil in a frying pan and fry the garlic and chilli until lightly browned, then add the spinach and cook for a further 1-2 minutes. Add the roasted squash to the chicken and stir through. 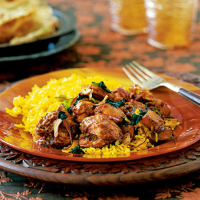 Serve the curry, scattered with the spinach mixture, on a bed of hot pilau rice and with a selection of Waitrose naan breads. To save time, precook the chicken and butternut squash and wilt the spinach in advance. Cover and chill until ready to assemble.